Media captionTeenagers appear to be posting pictures of stolen bikes and robberies on social media. A spray that links suspected moped criminals to a crime scene is being tested by the Metropolitan Police. The liquid would tag clothing or equipment with a unique chemical footprint only visible under ultraviolet light. The BBC has also learned that offenders are increasingly travelling into London from the Home Counties to commit thefts. The force says the average age of those carrying out crimes in London is 15. There has been a marked increase in the number of moped crime offences carried out in the capital in the last year. In the 12 months to the end of June 2017, the Met logged 16,158 crimes involving powered-two-wheel vehicles compared with 5,145 the year before. Police say phones, watches, bags and other mopeds and motorbikes are generally the target of thefts. 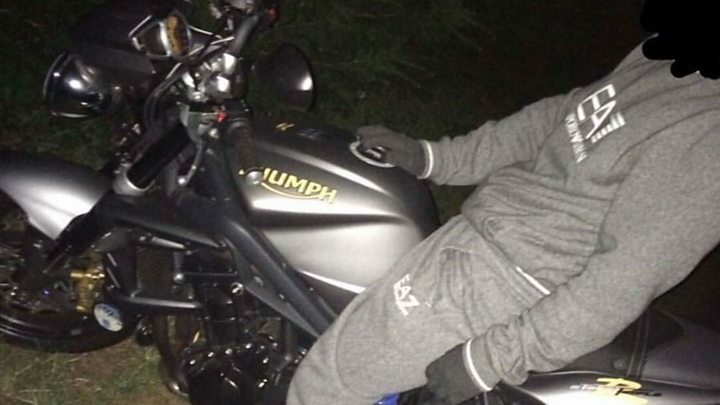 The BBC has also seen social media messages where offenders brag about selling stolen bikes. One account called "bristolbiketaker" features photographs of motorbike riders with masked faces, ditched or hidden bikes and bolt-cutters. Avon and Somerset Police is investigating the account. It says posts often taunt the owners of stolen bikes. Other accounts feature video of police chases filmed by offenders themselves and appear to show them selling keys for unlocking stolen bikes. Officers say they have developed new tactics - including the use of tyre-deflation devices - but now want to be able to track offenders. Det Supt Stuart Ryan, the force's lead on moped crime, said a tagging spray was being tested under Home Office guidelines. "If delivered it will be a very exciting change because it does give us an opportunity to track them in a different way than we've been able to do before. "We're trying to find a way we can deliver it safely both to the people on the bike and also the community and officers." Det Supt Ryan said offenders were often travelling into London to carry out thefts. "Mostly we're seeing it from Kent and Essex but we have had incidents from Surrey, Buckinghamshire, all round London coming in. "It's quite stark that the average for these offenders is 15."